What to do if you can’t / don’t enjoy your favorite things anymore? Last week I went for a few days to the South of France, visiting my dad and his partner. The Berlin weekend end of October worked out so well, so I was convinced to have a good time in France, too. I did enjoy it, it’s always fantastic to spend time with your loved ones. Traveling – nightmare. Packing, airport, unpacking, stress, just thinking of it is exhausting. Shopping – even worse. 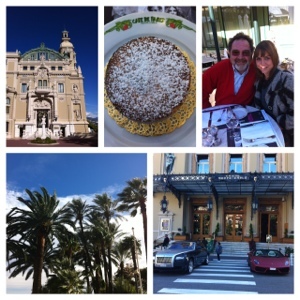 We spent 3 days in Monte Carlo but also went to Nice and Cannes to my favorite shops and boutiques. Horror. I don’t want or need anything anymore, well, a cure for MS would be great but unfortunately you cannot buy that. Food – still am a foodie and went to some great restaurants but it is kind of hard if you eat Paleo. So I had to taste a spoon of risotto here, some Joel Robuchon mashed potatoes there…and ended up with a funny stomach on day 3. However, the worst and most painful is to see the worries in the eyes of your loved ones. They try so hard to give you a good time and watch every move. Trying to understand what and how I feel and if I explain…man, this is not an easy one. My dad never left my side. Luckily as I stumbled once and he grabbed me in the last second. But of course, it cannot be like this forever, so a test every now and then is a good idea and I found out that I am just not ready yet and won’t push myself anymore. Another thing I noticed – all of a sudden you find other things to enjoy, little things, you just need to have an open mind for some or do the things you never had time for. Like going to the movies. Before lunchtime. By yourself. Having popcorn for breakfast ( sorry Paleo). Loved it, was my fun day this week and I watched Twilight to please my inner teenager. I decided one Anja fun day a week is a must. Next week it’s beauty spa morning and an evening with one of my best friends. I am very much looking forward to it. Hi Anja! I just saw that you live in Holland. I went to the American School of The Hague back in the 80s. We lived there for four years, and those were some of the best years of my life! We lived in Wassenar. I too have MS. My blog is http://www.touchingms.com. I just published an anthology of poems by people who have MS. Check it out!